Gridlock handle design affords easy hook-up and correct blade alignment with the outlet, even in darkness. 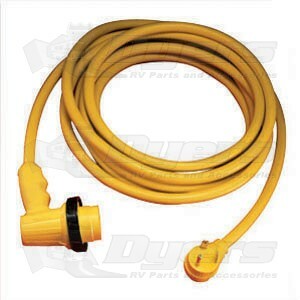 The cable itself is very good quality, however, the Black plastic connector knob not durable enough to tighten to camper power outlet. The plastic pops off if tightened too snuggly. Recommend a heavier duty connector. The weight of the power cord was making it separate at the RV end. I think the right angle one will be better.